Hello everyone! My name is Chuck, and I am the new Skacel employee. For those of you who are wondering – no, I am not Karin’s husband – that position was already taken! I am, however, the Director of New Product Research and Development. It is my job to help Skacel determine what yarns and products fiber enthusiasts want to buy and which will sell best for local yarn shops. This new position combines my two passions – knitting and research. I have been an avid knitter for almost four years, and I have been working in the research industry for over twelve. I am very fortunate to be able to say this truly is my dream job! To make a great first week on the job even better, at the end of last week I got to attend TNNA in Long Beach, California. TNNA is The National NeedleArts Association, and one of the many things this organization does is put on trade shows for yarn shop owners to see what’s new in the needlearts world. 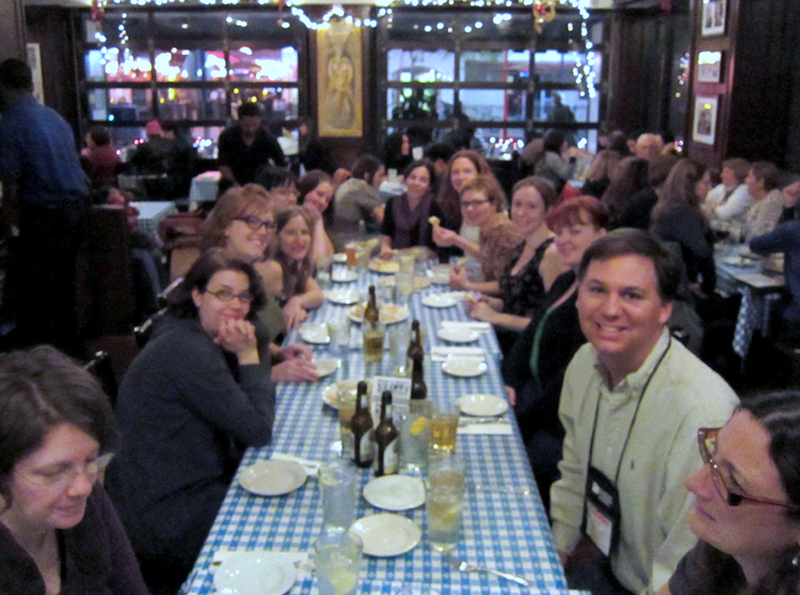 Everyone in the industry attends – so it was amazing to see and meet so many famous knitters! I got to meet celebrated designers like Cat Bordhi, Lily Chin, Nicky Epstein, Sandi Prosser and Mary Beth Temple. I met editors of magazines I love to read – Kara Gott Warner (Creative Knitting), Eunny Jang (Interweave Knits), Renee Lorion (Vogue Knitting), Rick Mondragon (Knitter’s), Carla Scott (Vogue Knitting), Erin Slonaker (YMN) and Penelope Taylor (Knit ‘n Style). And what an honor to meet the Ravelry folks – thank you Jessica, Casey, Mary-Heather and Sarah for creating and running such an amazing knitting resource and source of inspiration! Me (in the tan shirt) and some great knitting ladies – L to R: Lorajean (aka KnittedWit), Deb (aka Stitchy McYarnpants), Mary-Heather (aka RainyDayGoods), Anna, Erin (aka MintyFreshFlavor), Caro (aka SplitYarn), Laura, Kristi, Ysolda, Jessica (aka Frecklegirl), Amanda, me and Deb. 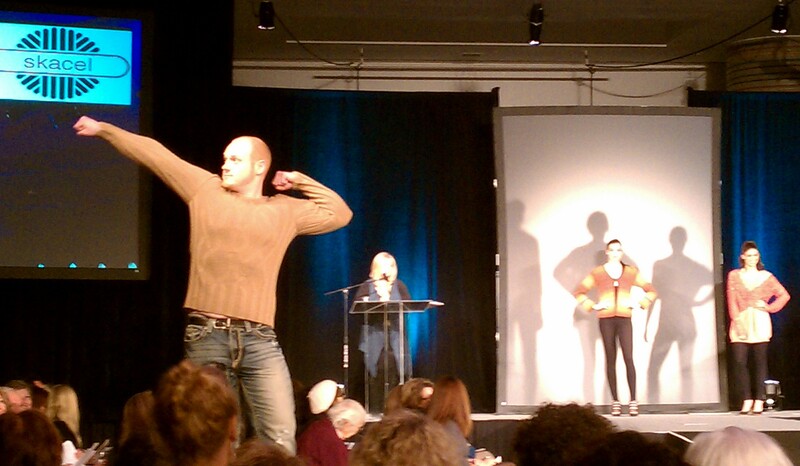 Cliff Haack (aka Vogue), a Skacel sales rep, models a HiKoo Simplicity sweater in the TNNA fashion show. 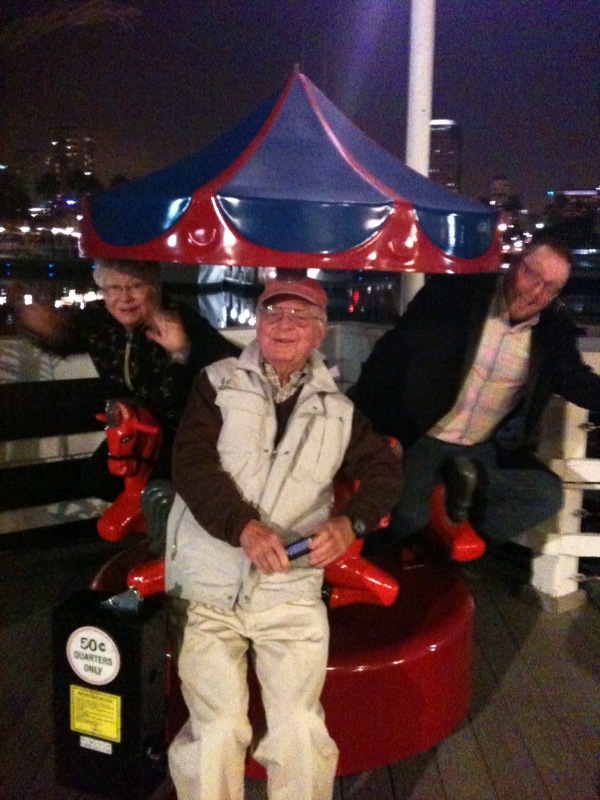 Ingrid and Hans Skacel ride the carousel with Rob. I also loved seeing yarn shop owners that I had met previously when shopping in their stores. I can’t travel anywhere without checking out a LYS or two! I also had the pleasure of meeting many of the yarn shop owners from all over the country that supply knitters with great Skacel products. It’s been a great first few days on the job, and I am really looking forward to shaping the yarns and products that come out in the near future! The first person to read this and email me will get their choice of a free addi circular needle! Just email me at chuck@skacelknitting.com and put welcome in the subject line.